Cogito ergo sum: I think, therefore I am. Influential declaration by René Descartes that only philosophy majors understand. Coleman, Norm [prez 1925–34]: One of Reed’s first professors [English 1912–20], Coleman coined the phrase “Comrades of the Quest,” which fit the new college so well that the students named their newspaper for it. Played key role in developing Reed’s faculty constitution, which gave professors a strong voice in the running of the college. Coleman left Reed in 1920 to serve as president of the Loyal Legion of Loggers and Lumbermen, but returned after the death of President Richard Scholz (q.v.) 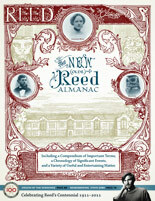 to become Reed’s third president. Coleman successfully raised almost half a million for the endowment and oversaw construction of the Hauser Library. After retiring as president, Coleman went back to teaching English at Reed until 1939. 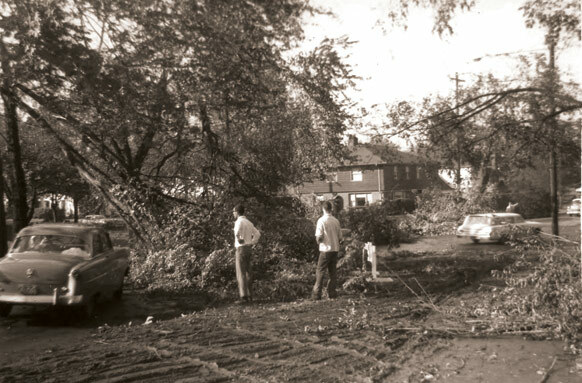 Students survey the wreckage after the Columbus Day Storm of 1962. Columbus Day Storm: Generally reckoned to be the most powerful extratropical cyclone to hit the United States in the 20th century. Starting October 12, 1962, with peak gusts of 100 miles per hour, it rampaged through California, Oregon, Washington, and British Columbia, killing 23 people, destroying 84 homes, severely damaging 5,000 more, and wreaking overall havoc estimated at $170 million. Sometimes attributed to divine retribution after Reed defeated Columbia Christian College 19–7 on the football field, which may be true. Sometimes blamed on the mock crucifixion staged by Reedies at halftime, which is probably false; most sources place that blasphemous reenactment (in which a student actually dragged a cross along the field) several years earlier. Cookery: Plato told Socrates in Protagoras, “There is far greater peril in buying knowledge than in buying meat and drink.” But Plato never had to eat in commons. 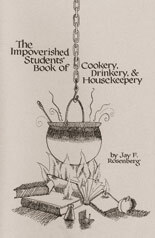 Perhaps it was the urge to find ways to evade the tedium of commons in the old days that turned so many Reedies into foodies and inspired Jay Rosenberg ’63 to write his classic, The Impoverished Student’s Book of Cookery, Drinkery, and Housekeepery, which many credit with demystifying the science of the kitchen. Our gastronomic alumni are far too numerous to list, but for example’s sake, we cite author James Beard ’24, Genoan Amelia Hard ’67, kitchen kaboodler Lynn Becraft ’75, barbecue baron Steven Raichlen ’75, restaurateur Kurt Huffman ’94, and salt shaker Mark Bitterman ’95. It will be interesting to track the progress of Reed epicures in the future now that the chow in commons is so much better. Creative writing: Art form based on the elements of blood, toil, tears, and sweat. Although courses in composition were taught in the 1910s, the first real creative writing class was offered in 1920 within the English department. After long, peripatetic years, staffed by itinerant faculty, the program finally found a home in the English department and hired two tenure-track professors around the turn of the century. Intriguing course titles over the years have included Screenwriting, The Personal Essay, From Shaft to Stimpy: Cultural Iconography and Idiom as Poetic Muse, and Found Poems. Influential profs (q.v.) have included Crystal Williams [2000–] and Peter Rock [2000–]. Many other well-known writers have taught at Reed, including James Dickey ’51 [1962–64], Donald Justice [1962–63], Galway Kinnell [1966–67], Kathleen Fraser [1972, 1994–95), Gary Miranda [1979–87], Maxine Scates [1989–2006], Henri Cole [1992–93], Vern Rutsala ’56 [1992–93, 1999–2000, 2006–07], Carolyn Kizer [1992–93], and Debra Ginsberg ’85 [2002–03]. Cross-canyon: Built between 1959 and 1962, when the modernist bloom was still on the rose, the cross-canyon dorms (Akerman, Coleman, Sisson, Chittick, Woodbridge, Griffin, and McKinley) have been home to thousands of students who came to savor living at the edge of a wooded glen. The architects doubled up the rooms facing into the canyon to allow as many students as possible a view, according to Neil Farnham ’40, partner in the firm that designed the dormitories. The use of glass and sloping roofs were attempts to tie the buildings to the landscape. The buildings featured innovations such as radiant floor heat and tilt-out vents for fresh air, with single, double, and triple rooms clustered around common living areas to promote interaction. In 1997, Akerman, Coleman, and Sisson were razed to make way for Bragdon Hall. 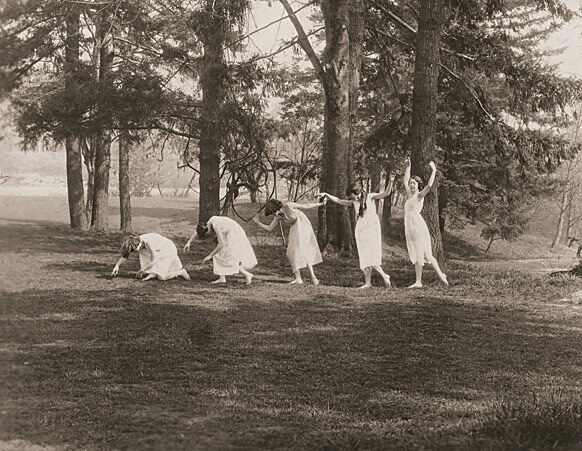 Students dancing on the lawn, 1923. From the right is Verda McCallum '23, Beatrice Olsen '24, and fourth from the right is Elizabeth McKinley '23. Dance: Kinetic sculpture. 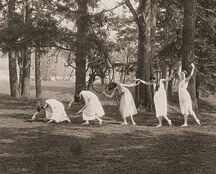 Reed has a long tradition of dance (offered as a P.E. class in 1911). The discipline got its own department in 1949, disappeared a few years later, and reappeared in 1964. The curriculum at Reed is a mix of theory and practice, offering instruction in basic techniques, design, theory, criticism, and composition. Intriguing courses have included History of Dance; Analogous Forms; Improvised Performance; Dance and Technology; and Queer Dances: Gender, Sexuality, and Identity in Modern and Contemporary Concert Dance. Key figures in dance at Reed include Elfi Hosman [1963–68], Judith Massee [1968–98], Pat Wong [1975–2009], and Carla Mann ’81 [1995–]. Dean of students: In the early days, there was no dean of students, only a dean of women. (Perhaps the idea was that male students would look after themselves—a proposition as unrealistic then as it is now.) So the herculean task of guiding, counseling, cajoling, and comforting students was left to professors, presidents, spouses, and classmates. The role of the dean broadened during and after World War II. No title can fully describe the job. No words can express our gratitude. But let us salute those who have had the courage and compassion to take on one of the toughest jobs in the world: Eleanor Harris Rowland [1911–17], Maida Rossiter Bailey [1912–42], Ada Chenoweth McCown [1929–31], Cheryl Scholz MacNaughton [1938–43], Cornelia LeBoutillier [1941–43], Robert Canon [1948–54], Ann Shepard ’23 [1950–68;], Josephine Grannatt Davis ’41 [1958–63], Pat Hanawalt [1959–82], Les Squier [1955–62], Jack Dudman ’42 [1963–85], David Groff [1983–87], Paula Rooney [1981–85], Susan Crim [1985–89], Jim Tederman [1990–99], Regina Mooney [1999–2002], Mary Catherine King [2002–07], Jerlena Griffin-Desta [2008–09], and Mike Brody [2009–]. Diver, Colin [prez 2002–]: Diver came to Reed from the University of Pennsylvania, where he was the dean of the law school. Earlier, he taught at Harvard and Boston University and was featured in the Pulitzer Prize-winning book Common Ground by Anthony Lukas. Diver has helped Reed become more diverse, boosting the proportion of minority students from 14 percent to 26 percent, while at the same time doubling the college’s budget for financial aid to $22.5 million a year. During his tenure, Reed added 13 professors, made significant improvements in the performing arts, launched an environmental studies major, built several new dorms, and spearheaded the most ambitious campaign in Reed’s history, the Centennial Campaign. Diver retires in 2012; we leave detailed analysis of his legacy to future almananglers. Diversity: How to define diversity in the context of Reed? The standard response is to look at the students. Ethnic minorities now comprise 26 percent of the student body, first-generation students 13 percent, and international students 9 percent. But there are many other dimensions to consider, such as the ethnic, intellectual, and experiential diversity of faculty and staff. Reed’s diversity statement, adopted in 2009, states that “Reed embraces the inherent value of diversity. It is committed to attracting the best and brightest from every group, including those who have historically experienced discrimination and prejudice, for it recognizes that dialogue between people with different perspectives, values, and backgrounds enhances the possibilities for serious intellectual inquiry.” The college appointed its first dean for institutional diversity in 2011. Divestment: Withdrawal of college assets from morally questionable investments. In the ’80s, the term was synonymous with student campaigns to get colleges and universities to withdraw their endowments from companies doing business in South Africa, such as General Motors, Mobil, and IBM. At Reed, the trustees claimed such action would violate the college’s policy of political neutrality. In the face of escalating student protests, the trustees in 1986 adopted the Sullivan Principles, a set of corporate guidelines intended to encourage responsible conduct in South Africa, but this did not satisfy protesters. More than 100 students occupied Eliot Hall demanding full divestment. The trustees stood firm. Further protests followed until 1990, when Nelson Mandela was released from prison and South Africa began to dismantle apartheid. Dogs: Canis lupus reedus. Distinct canine subspecies, sometimes suspected of being the reincarnations of former students (or professors). For many decades, dogs roamed freely on the Great Lawn, harassing squirrels, interrupting romantic moments, and stealing edibles. They attended classes, slunk in the library stacks, leapt on visitors, slept in dorms, scrounged in commons, and slobbered on distinguished members of the community. The advent of a dog policy in the ’90s cur-tailed (arf!) some of their more outrageous antics, but their grace, intelligence, and loyalty have proved endearing to many campus figures, including Amanda Reed, A.A. Knowlton, and Marion Patullo, who endowed a drinking fountain for dogs and humans in memory of her trusty terrier Angus.